As featured by the Mail Online, September 2018: "Remarkable life of English singer who became and aircraft plotter in Malta during World War Two"
You'll be £15.00 closer to your next £10.00 credit when you purchase Ladies of Lascaris. What's this? Described in the Times of Malta in 1942 as ‘Christina of George Cross Island’, she herself said Malta ‘is carved on my heart’. For years after the Second World War in small corner cafés and bars that are such a feature of Malta’s towns and villages, people talked about a remarkable RAF photo-recce pilot called Warby and his stunning companion Christina, a true heroine, they said. Yet she died alone and unnoticed and was buried in a shared grave. unique picture of life under the most intense bombing ever conducted, its part in victory in the Mediterranean and eventually in Europe. This account of the life of an interesting lady and acquaintances set against the backdrop of the Second World War siege of Malta is a ‘good read’: all that an author may expect. 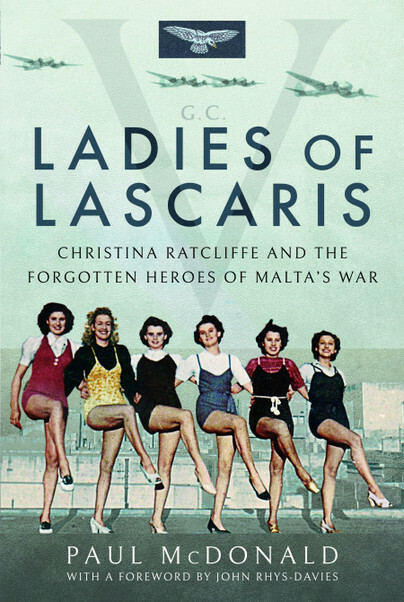 The thread of the story, Christina Ratcliffe, is interesting in itself but superimposed on the well-researched situation of Malta at war it creates a tale of the indomitable spirit of the population. The story of a young girl, perhaps a little feckless but strong in character, travelling so widely in the 1930s would be interesting enough. This story shows how she develops into a charismatic lady under very difficult conditions who helped create an entertainment group in the early part of the war and became a watch supervisor in the plotting room of the wartime Air Headquarters of the most bombed area in the world. Her romantic involvement with an RAF pilot and the dangerous life he led is well recorded without being mawkish. Her commitment to Warburton is shown to be complete making the decline of her later years more poignant and touching. To complete the story, creating a real feel for the time, the recollections of various characters living in Malta makes for a complete picture of how people of different callings were affected by the privations of a siege that lasted for over two years. I would recommend this book to anybody who enjoys a good factual human story set against a fascinating account of a crucial period of history. This is a most curious and multi-facetted little volume... This volume may be of interest to those looking for a ‘War story’ with a difference and those with an interest in military aviation, the Royal Air Force, the ‘Battle of Malta’, World War II and the Mediterranean Theatre of Operations. Paul McDonald is a former Royal Air Force pilot. He served as a photo-recce pilot in Malta and as a Tornado pilot in Germany. He was decorated for gallantry in 1980 and appointed OBE in 1995. He lives in North Yorkshire. His previous books Winged Warriors - The Cold War from the Cockpit (2012) and Malta’s Greater Siege & Adrian Warburton DSO* DFC** DFC (USA) (2015) were also published by Pen and Sword Limited.